Aluminium powder coated folding frame. 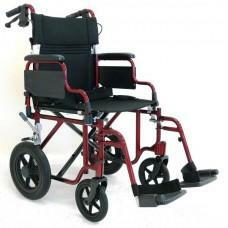 Fold down back rest with padded arm rests that can be folded up or removed. Attendant rear control handbrakes, manual brake on the rear wheels. Seat belt fitted. Max user capacity 180kg.